NOAA’s Climate Variability and Predictability (CVP) program is announcing 14 new three-year projects in FY17 that aim to improve understanding of processes that affect the propagation of intraseasonal oscillations—specifically the Madden-Julian Oscillation (MJO)—in the Maritime Continent and broader regions. The competitively selected programs total $7.4 million, including $4.8 in grants and $2.6 in other awards. 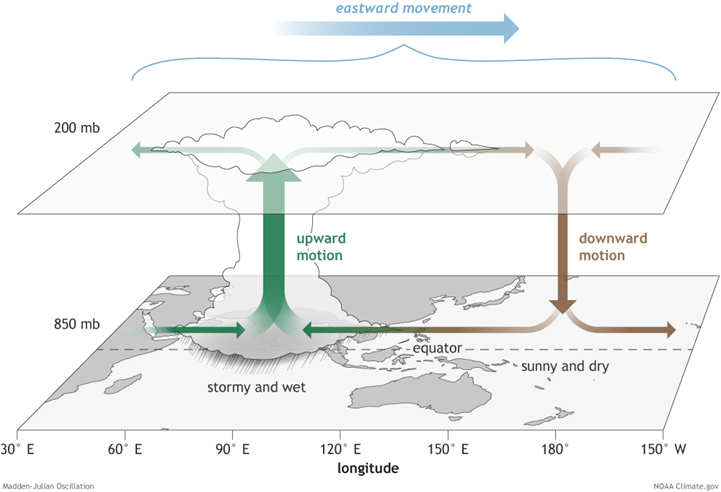 The surface and upper-atmosphere structure of the MJO for a period when the enhanced convective phase (thunderstorm cloud) is centered across the Indian Ocean and the suppressed convective phase is centered over the west-central Pacific Ocean. Horizontal arrows pointing left represent wind departures from average that are easterly, and arrows pointing right represent wind departures from average that are westerly. The entire system shifts eastward over time, eventually circling the globe and returning to its point of origin. Climate.gov drawing by Fiona Martin. CVP supports research that enhances our process-level understanding of the climate system through observation, modeling, analysis, and field studies. Since 2011, CVP has sponsored research projects focused on improving scientific understanding of the MJO, a 30- to 90-day natural climate variability pattern that starts in the Indian Ocean and propagates around the world. Improvements in our understanding of the MJO—how it is initiated and how it travels around the globe—will increase our prediction skill within the 2-week to 3-month time window where there is currently a skill gap. Better understanding of the MJO would also increase the accuracy and lead time for predicting extreme weather over the United States, thus improving people’s ability to prepare for dangerous conditions, such as very heavy precipitation caused by “atmospheric rivers.” On average, about 30-50% of the west coast’s annual precipitation occurs in just a few atmospheric river events, which sustain the region’s water supply but can also produce damaging flood disasters. In collaboration with the Office of Naval Research, CVP is expected to support activities of the Propagation of Intra-seasonal Tropical Oscillations (PISTON) Departmental Research Initiative with the projects funded in FY17. The CVP component of the PISTON also contributes to the Years of Maritime Continent (YMC), an international project that creates a collaborative framework for multi-disciplinary field observations and modeling to better understand the role of the Maritime Continent on the global weather-climate continuum. YMC is co-led by the Indonesian Meteorology Service (BMKG) and the Japan Agency for Marine-Earth Science and Technology (JAMSTEC). The selected projects investigate different processes that affect the speed, intensity, disruption, and/or geographic placement of the MJO propagation by using a combination of in-situ/ ship-based/remote observations, data analysis, modeling, and/or theoretical understanding of local and remote processes.